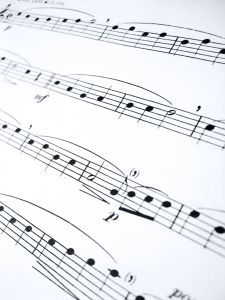 If you need sheet music notated, music scores printed, or book formats prepared, Trent can provide this service for you. 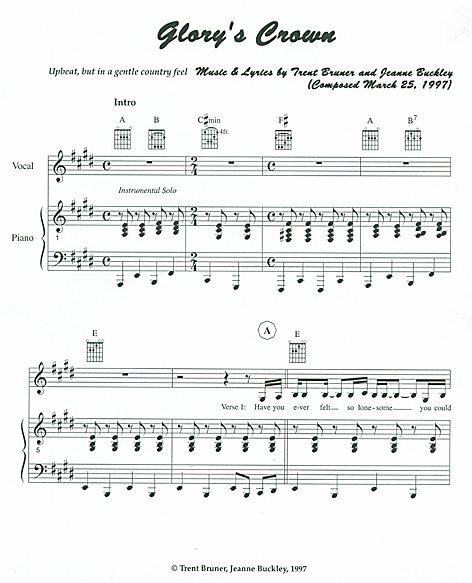 Trent has provided sheet music for musicians in Canada, the United States and Europe, ranging from simple lead sheets to scores with piano parts included for music books. He has provided notation for fiddlers, violinists, pianists, singers, choirs and small classical ensembles. Since there are many score formats in sheet music, there is not enough time for many of these formats to load up on many computers, so samples from two of his own compositions are included for your reference. 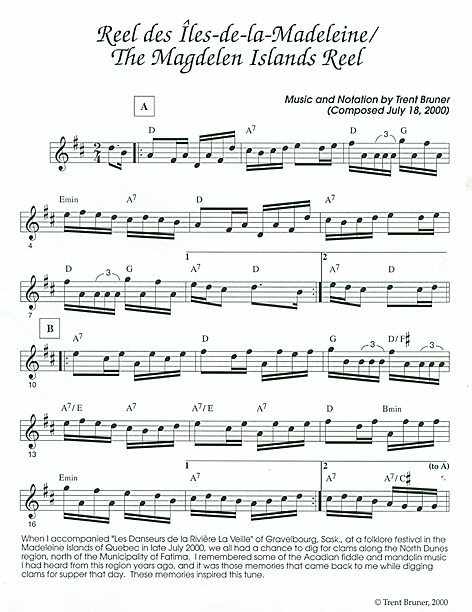 Trent has provided notation contributing to the publishing of music books for performers such as Calvin Vollrath, John Arcand, The Cleavers, Gordon Radu, Randy Foster, Bruce Armitage, Paul Bourgeois, Mark Mallett, Sister Lucille Wolters, Carol Kennedy, Mike Sanyshyn, Mark Sulllivan, Trent Bruner, Brian Hebert, Dennis Harrington and Willie Sawrenko, and organizations such as Life-Vision Communications, Cat Chat, and the Gabriel Dumont Institute. Trent has perfect pitch, which helps in distinguishing notes when creating printed music. With this ability, Trent can notate from either hand-written manuscript, from a tape, CD/MD (standard mono, stereo or LP4 format), MP3, WMA or other electronic music formats. He can also e-mail your notated music to you in PDF format in both sheet music and book format. Contact Trent for rates on PDF files. If you provide a tape, CD, MD, MP3 file or similar, make sure the recording is clear, and that the music is played at both a slow tempo and a performance tempo (where applicable) to aid with the work. If you have additional parts requiring notation for a music score, please ensure these parts are recorded separately. If you provide a draft manuscript, ensure that each copy is readable. If you provide a song, please enclose lyrics sheets. If you send the lyrics electronically (e-mail, CD or similar), this will speed up the process. Trent is able to arrange music upon request within the boundaries of copyright law. Please inform before the notation work begins if the music provided is your own or your own arrangement of a popular work. If you wish to have Trent arrange music for you, understand that he will own the copyright on the arrangement notated for you, but copyrights on the original work will be owned by the composers, lyricists and other arrangers as designated. Within two weeks of mailing/e-mailing the sheet music to you, Trent will make minor changes or modifcations for a $5.00 shipping/processing fee; no charge if it is Trent's mistake. Any "original" work submitted to Trent Bruner is assumed to be the client's property. Therefore, upon request, your name and the copyright date will appear as shown on the samples on this web site. Also, arrangements will indicate the client's name and/or organization and date if requested. Trent will not distribute any of your notated music in any form unless you give him written authorization and direction as to how you want it done. As a music notator, Trent wishes to honour all composer privileges under copyright law. Trent does not have the ability to give legal advice or provide legal assistance. Web sites with this information are listed in the links section of this web site. Clients agree to hold Trent Bruner harmless for any liability under services, workmanship or claims of copyright infringement or performance rights held by clients or other parties.